1. Watch kangaroos out the window: on the way there you’ll follow the Stuart Highway, which is the biggest highway in Australia stretching from Darwin to Port Augusta in the south. One of my favourite moments during my time in Australia was watching the kangaroos bound alongside us as we drove. If you’re the one driving be careful, their great weight can easily cause damage to your car, and you. 2. Swim with crocodiles: well, where crocodiles have been. 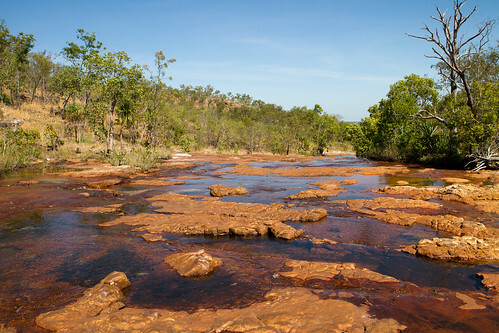 Litchfield Park is one of the safest parks in the whole of the Northern Territory to swim in, but check with your guide before you go diving in headfirst anywhere. 3. Photograph Florence Falls and Tolmer Falls: walk along the top of both falls through the bush and the monsoon forest to see the waterfalls cascading into a deep plunge pool, before you take the plunge yourself. At the bottom of Tolmer Falls you might find a few colonies of rare Ghost Bats and Orange Horseshoe Bats too. 4. Wangi Falls:swim in the crystal clear pool and walk through the rainforest up to the top of the falls. Because of its size this is one of the most popular sites in the park so there are easily accessible steps down and boardwalks all around. 5. Tjaynera Falls: these falls were my favourite, although you’ll need a 4WD to reach them. The open creek has a beautiful waterfall –stand under it to pound your problems away with a free massage. You can also camp here if you want to stay over in the Park. 6. 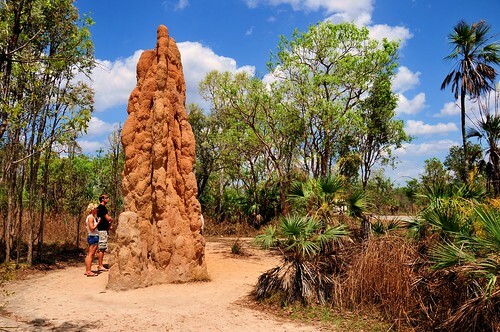 Photo the magnetic termite mounds: they look like simple arches, tunnels and chimneys, but the termites knew what they were doing when they built these architectural delights. They’re insulated and divided into chambers for the termite colonies – some are as high as 4m. The clever little termites built them to align north to south so the sun doesn’t dry them out and the temperature can be as cool as possible. If you’re set on seeing these, check ahead from December to March as the roads can be flooded. 7. Fill up at the Litchfield Café: serving breakfast, lunch and dinner, the Litchfield Café is the perfect way to get the energy to hit the afternoon at the park hard. 8. Swim in the creeks: Surprise Creek Falls is a good one for refuge from the sun in simple waters, and there’s also a picnic area nearby. Walker Creek Trail flows out of the Tabletop Range and has some great swimming spots along the route, as well as areas to camp. If you’ve come independently and want to get away from the crowds head to Greenant Creek. It’s not as big as the others so the tour operators steer clear, making it perfect for solo explorers. You could even sit in the rock pools of the Tjaetaba Falls nearby, preferably with a glass of Champers. Buley Rockhole is another cool area to check out if you’re a water baby. The rock pools are set in beautiful rainforest surroundings so you can find your own private spot to kick back and relax. 9. Visit Bamboo Creek Mine: Litchfield National Park is a pretty cool place to check out an old mine. Just past Bamboo Creek you’ll find the ruins of the old stone buildings that used to be the miners’ living quarters. Follow the path and you’ll reach the old mine shaft and onwards to the mill ruins where a lot of the old machinery still stands. The old engine is great for some ‘in action’ camera shots. 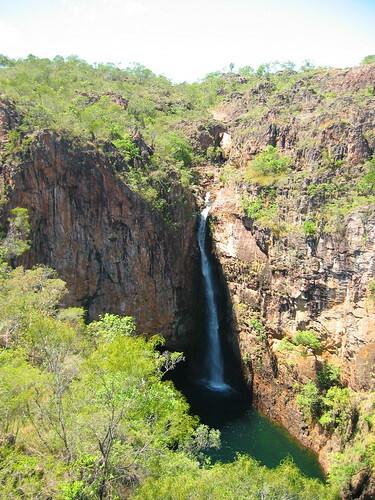 Litchfield National Park is close to the town of Batchelor. If you’re planning on navigating your way there under your own steam make sure you’ve got strong car, preferably a 4WD. For more unique Experiences in Australia visit our website or call 0208 045 4186 to speak to an Aussie Specialist.